What is ‘IELTS Life Skills” test? - is a new English Language assessment test designed for the people who want to apply to get UK Visas and Immigration permissions. This is a special IELTS test for people who want to apply for UK Visas and Immigration for a ‘family of a settled person’ visa or for ‘indefinite leave to remain or citizenship’. This test is offered by the same IELTS authorities (British Council, IDP: IELTS Australia and Cambridge English Language Assessment) and it assesses the Speaking and Listening skill of the test takers. You need to apply for a UK visa for immigration to the UK as a family member of a settled person in the United Kingdom. You are applying to get UK Visas and Immigration permission for indefinite leave to remain in the United Kingdom. You are applying for UK visas to get the citizenship in the United Kingdom. Unlike IELTS main test, IELTS Life Skills is a test that comprises only Speaking and Listening section. In fact, IELTS Life Skills test is an approved test of speaking and listening for UK visas and immigration. IELTS Life Skills test is available at CEFR Level A1 and CEFR Level B1. CEFR stands for Common European Framework of Reference for Languages. IELTS Life Skills A1 test is required for applying to get UK Visas and Immigration for a ‘family of a settled person’ visa. IELTS Life Skills B1 test is required for applying to get UK Visas and Immigration for indefinite leave to remain or citizenship in the UK. Visit this page to know everything about this test: IELTS Life Skills FAQs. If you are already living in the UK and want to make it your permanent home. If you want to become a British citizen or get a British citizenship. IELTS Life Skills exam is designed is to test whether a person meets specific immigration requirements. As an IELTS Life Skills test taker, you only need to demonstrate your speaking and listening skills. There is no Reading or Writing section in IELTS Life Skills test and your Speaking and Listening skills will be assessed at the same time. 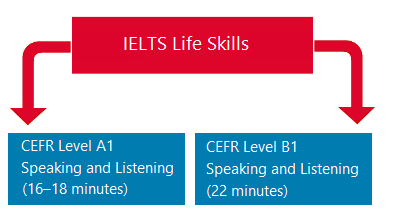 IELTS Life Skills at CEFR Level A1 takes 16-18 minutes and Level B1 is 22 minutes and you need to take the test with another test taker and one Examiner. Your own performance on both speaking and listening will be assessed during this one session. You cannot take any break during the exam. Your score and assessment would not be affected by the performance of the other test taker who is paired with you in the IELTS Life Skills test. You will receive one copy of the IELTS Life Skills Test Report Form usually within 7 days of your test and you can take this test as many times as you want if you do not pass the exam. However, you need to register every time you sit for this test. The IELTS Life Skill test does not have any band score and has only two possible results: Pass or Fail. You will get a Test Report Form usually within 7 days that would denote whether you passed or failed in your test. If someone fails the test, s/he can’t use this Test Report for a visa application. Comprehensive details on IELTS Life Skills test could be found from the IELTS Life Skills FAQ section.